Why Develop a City Soul Context Report? What Qualifies an Organization as Charitable? The City Soul Explorer Toolkit offers four modules and practical tools to facilitate communication and closer collaboration between city planning and faith-based organizations. The Toolkit outlines a way in which the often distinct worlds of city planners and administrators and community-serving religious organizations can be bridged and brought closer together to build the social capacity of cities, towns, and neighbourhoods. At Cardus, we believe cities and related communities are the future of our lives together. They are settings dense in social interactions, very complex in their functions, and very difficult to change. Historic and contemporary observations strongly suggest that cities are central to a flourishing citizenship, but they can also impair our full participation. This contradiction is part of the great challenge of cities. We recognize that our social infrastructure—the patterns of relational interactions—reflects our physical infrastructure. Social institutions, such as faith communities, are an essential link within the complex relationships between people, culture, and the physical spaces where people live. The Social Cities program at Cardus is organized around two orienting questions: What makes a good city? and How do we get there? There are many ways in which the Social Cities program is pursuing answers to these questions. The City Soul project, of which this City Soul Explorer Toolkit is a part, shares that pursuit and focuses—in particular—on faith communities and city planning interactions. The purpose of the City Soul project is to strengthen city planning through increased contributions from faith-based institutions. City Soul facilitates this by enhancing communication, understanding, and collaboration between faith communities and city planners. Faith communities rarely interact with city planners except when problems arise over issues such as zoning and parking. City Soul moves beyond this by facilitating the exchange of knowledge between these groups in a more enriched way. The initiative also provides direction for faith-based organizations (FBOs) to work collaboratively on community and common good initiatives. City Soul has been developed through initiatives in a variety of cities including Calgary, Edmonton, and Cambridge (ON). Every city and community is unique, but in many cases they can make use of common resources such as those provided in City Soul Explorer. City Soul Explorer outlines a way in which the often distinct worlds of planning and faith-based organizations can be brought closer together. This in turn will add to the social capacity of city, towns, and communities. Rather than wait to the end to capture the challenges encountered and mistakes made, it seems prudent to place them here, near the beginning. Hopefully it will inspire you to face the difficulties as part of the exciting opportunity that this form of city building can take. It may also help to see that although your own setting is unique, it shares dynamics common to other places. These lessons arise from reflection and from the direct input of a wide range of stakeholders and participants over our years of work in local communities. Faith-based organizations and city planning departments are often stretched to the limits in terms of what they are committed to deliver organizationally. They may be understaffed or constrained by various organizational dynamics. At the same time, there are people in these settings who aspire to much more. The challenge is to find them and then provide pathways for those with higher aspirations to grow and make a greater impact. envisioned by the City Soul work are long-term, these leadership dynamics are extremely important. We have not solved this challenge. What you learn in your own attempts may be a great service to the rest of us. In most communities and cities, the FBO landscape is fragmented. Most FBOs are accustomed to limited collaboration with other FBOs (even within their own traditions) and may find only temporary cohesion when a larger external threat arises (a zoning change that threatens their status or the spectre of losing their tax-free status). There often exists some cooperation between ministerial associations and some community service groups, which may serve as a starting point, but we have learned that we can’t underestimate how difficult it is to find a coherent organizing point for the FBO community. Given the above lessons, one challenge is finding a way to talk about “what time it is” (or the general climate, welcoming or not) in terms of the cultural position of FBOs concerning the wider society of their communities and cities. It does not appear likely that FBOs will simply disappear. In some places they are growing, as religion is taking a more significant public role in global and local events, and the role of religion in human culture is increasingly recognized as a permanent feature rather than a temporary state. How should we talk about this changing religious climate? Unfair stereotypes and assumptions about religion are common in the media. Most news about religion is negative, while the contribution of religion to our common lives is significantly positive. There is work to be done to connect FBOs and city planners in the midst of these challenging dynamics. The dynamics of FBOs and planning are also part of the wider landscape shift from human to technological solutions. Smart cities, data collection, complex analysis, and other techno-bureaucratic solutions are often given unthinking acceptance by citizens. The role of religion can seem antiquated by comparison. FBOs need to look to their right and left to see other groups, including non-religious groups, who are gaining ground in community organizing, neighbour-to-neighbour connecting, and other forms of common good support that can offset these other solutions. The ability to do that varies widely across the FBO landscape. Practically, the matter of who pays for the development of these new elements of social infrastructure is critical. Where will the investment of time, learning, and convening come from? There are creative ways to begin to bridge these gaps, but the creativity quotient often poses a challenge to interested parties. Key leaders can help to steward these dynamics, but resource needs will have to be solved. There is a learning requirement for the use of some of the tools. While it isn’t a high barrier compared with other challenges, we have learned that even modest obstacles can impair a fledgling effort. Development of a wider network of resources that can span from one city or community to another will be part of the solution, but it is important to recognize that processes that are obvious or seem simple in one setting can be opaque and complex in another. We welcome feedback, engagement, and discussion of strategies and collaboration. I would welcome hearing from you to talk about resources, your local situation, and how we could support what you are doing. A meeting of planners, architects, faith leaders and think tank members met in Calgary in 2008 for a day to talk about faith and the city. They called it “Planning in Good Faith”. In 2009, Cardus happened across the downtown plan for the City of Calgary. The objective was to have a full service downtown where people could live, work, play, raise a family, or myriad other things that individuals and groups might want to pursue. The complication was that in the plan no provision was made for the religious practices of the prospective new inhabitants, particularly if their practices included a need for sacred or social service delivery space. When Cardus engaged with the City of Calgary, the City was, to their credit open to the possibility that there could be another dimension that could enrich their already well-developed plan. An audit of downtown institutional capacity was commissioned and one outcome was an eventual change to the Centre City Plan in Calgary that included formal room for faith-based organizational engagement in developing the plan. How do planning and faith-based organizations work together in my city or community? The patterns of interaction between individuals and with larger groups form our communities’ social infrastructure. These daily interactions in the community give rise to our physical infrastructure needs. Planning moves beyond patchwork approaches to developing spaces to applying a coherent vision for the life of our cities. Intermediate institutions such as Faith-Based Organizations (FBOs) are deep repositories of meaning and culture that have a strong neighbourhood presence. Often they interact neither with the city planning process nor with each other. Thus, they do not fully understand their collective presence nor their potential within the social ecosystem. Creating a City Soul Context report charts the presence of FBOs, helping these groups to see themselves and each other within the social and physical context of their city. The report also provides city planners with the current data on FBOs, giving consideration for the social presence of FBOs and their potential within the city’s plans. City Soul explores the potential to increase the capacity of the social infrastructure of a city through the development of institutional connections between city planning and the FBOs. Through the project, FBOs and the city can identify areas of mutual interest in which to develop stronger collaboration. Another benefit is that the City Soul Context report brings clarity to the FBO community, developing points of common interest and helping the community understand their collective presence in a city. Rather than simply procuring privileged access to the city, the project assists FBOs to identify the spaces where they are best suited to enhance the development of social infrastructure. The report provides an overview of the planning issues and priorities for the city. The presence of FBOs in the community and the spaces they occupy are identified, revealing connecting points and further issues for exploration. What follows is an outline that a user can employ or modify to explore the planning landscape and the presence of FBOs within that landscape. This scan is a big-picture overview of the city that identifies the key markers of the community that shape the broad identity of the city. Users can access demographic information such as population and population projections for free through the Statistics Canada Website. Local municipal planning departments can often provide a great deal of demographic data by specific areas as well as population projections. Significant economic drivers such as large employers and economic influencers should be identified. The environmental scan should also identify educational centres such as colleges and universities. Locate significant publicly available planning documents and growth plans, such as the Municipal Official Plan or Strategic Plan, to identify the philosophies and values that shape planning in the city. Take note of other influences such as provincial initiatives that directly impact city planning. Determine which planning issues are attracting public interest. What planning documents have influenced the city in the past? Which documents outline current planning priorities? What are the key concepts and philosophies represented in the planning documents? What are the planning issues that attract public interest? Which planning issues are reported in the local paper? What provincial planning directives influence city planning (e.g. protection of industrial lands from non-employment uses, achieving transit supportive residential densities)? Are there relevant barriers to implementing planning objectives? Consider the priorities and plans for the following planning issues. This is a broad overview and need not be exhaustive to be informative. Core areas: For many cities, downtown core areas were once hubs of activity. In recent years, many cities have been strategizing to revitalize core areas. What are the parameters identifying the core areas? Are there plans or objectives for the use of core spaces? Housing: Growing cities require living space for people across socioeconomic lines. Does the city have an affordable housing strategy (e.g. accessory unit policies, financial incentives, working groups)? What is the rental vacancy rate (e.g. various Federal, Provincial/State, Local reports)? Where is new housing being built? How is the resale market faring? Heritage: Cities have an interest in preserving historical character even as they renew infrastructure and grow. How do city plans account for heritage buildings (e.g. registers of historic properties)? Are there particular neighbourhoods where heritage is a focus? Which groups strive to protect historical character? Transit: Cities spend a significant amount of resources on transit. What are the priorities for transit in the city? What are the concerns and issues around public transit? What infrastructure issues concern transit? How does the city support alternative modes of transportation, such as cycling? Economic development: Developing economic opportunity is an ongoing priority for most cities. What industries are significant economic drivers in the city? Who are the significant employers? What are the big-picture goals for economic development? How will economic development plans impact future land use? How are open land and natural areas protected and managed? How are trail and park systems managed? Social infrastructure: social structures within the community can be difficult to see, yet these factors play a significant role in quality of life and long term viability. Social institutions function in the space between individuals and the city, often absorbing negative disruptions and amplifying positive contributions such as volunteering and giving. It is the social infrastructure space where FBOs operate. Although many aspects of FBOs go unseen and are not well understood, there are many ways to gain a deeper understanding of who they are, what they do, and how they contribute to the neighbourhoods and communities they are part of. Understanding their role in your community is an exploratory process. The following ideas provide a way for you to extend your own explorations. Identify the faith groups represented in the local population to better understand the influences shaping how faith is understood and practiced in a city. This section explores the registered religious charities operating in a city. There are a number of categories to explore and tools for accessing and displaying data. How many FBOs operate in the city? Which religions or denominations are represented among the FBOs? Tools: The Canada Revenue Agency’s (CRA) T3010 Charities Listings provides a wealth of data on FBOs. See the Tools Module for more information on T3010 data. Where are FBOs concentrated in the city? What are the main activities of the surrounding areas (commercial, residential, industrial)? Where are FBOs located in comparison to core areas? Where are FBOs least likely to be found? Do any patterns emerge when viewing the locations of FBOs in the community? Tools: Use a Google Fusion table to create a map of all FBO locations in the city. This tool can be used to create a “density heat map” and to map the location and revenue size of FBOs in the city. See the Tools Module for more information on mapping software. While FBOs typically operate independently, they do occasionally unite around common missions, goals, or core beliefs. While many of these networks are informal, FBOs also form official or semi-official associations (such as ministerial councils) either through denominational connections or core causes. Strengthening FBO networks is a core aim of City Soul. What are the formal FBO networks or associations in the city? What are the informal FBO networks in the city? Which FBOs are most connected? Which are least connected? How might these formal associations be leveraged to enhance the relationship between FBOs and city planning? Tools: The Network Mapping tool available in the Tools Module demonstrates step-by-step how to map a network. The tool shows users how to analyze a network map. The previous sections establish an overview of City planning and the FBOs. The next step is to examine how these two aspects of the city converge. Having investigated the significant publicly available planning documents and growth plans, where do FBOs integrate into the city? Are religious institutions and FBOs acknowledged or alluded to in planning documents? Assess where religious organizations and communities fit in existing city plans. Reflecting on the data above, where can FBOs be integrated into planning for the common good of the city? Where are FBOs located in comparison with core areas? Growth areas? What are the main activities of the surrounding areas (commercial, residential, industrial)? Where are the areas zoned for institutional spaces? Where are FBOs not well represented and how might the common good be served by their presence there? Are FBOs located where they are needed? Do FBOs’ activities interconnect with other groups and organizations in their neighbourhoods? Are these activities oriented to the needs of the FBO, the surrounding community, or a more distant context? City Soul considers the social presence of FBOs and their potential inclusion in the city planning process. The City Soul Context report is a tool that assists in the knowledge exchange necessary to further relationships among FBOs and relationships with the City. How might the collected data enhance these relationships and knowledge exchange? What should I consider before beginning a City Soul Context report? A Context report can be as unique as the city it features and need not be formulaic. As you consider how the Context report will reflect your city, you may wish to consider the following questions. Who will author the report? Much of the useful data and materials are freely available. Yet locating and translating data and authoring the report require a significant investment of time. If there is a university or college in your area, consider working with a student to assist with research and writing. Developing a relationship with the city’s planning department can help with locating key planning documents. The planning department is likely familiar with various mapping tools and can serve as resource for mapping and other background data. Who are the faith-based leaders to be engaged? Which city leaders should be included? Who are the intended secondary users of the report? What existing networks could be utilized to promote the report? Where will the report be posted online? How will the Context report be funded? Associated costs could include hiring a researcher/author, design, print, distribution, and promotion costs. What sources of funding are available? Most FBOs operate as registered charities as defined by the Income Tax Act. The Canadian Revenue Agency, Charity Directorate regulates charitable organizations, designating groups as charitable, private foundations or public foundations. Each designation must adhere to rules concerning governance, charitable activity, and receiving and dispersing funds. Further information on how organizations are defined is available here. Reforming Canada’s charitable sector has been an ongoing discussion for decades. A thoughtful roundtable discussion on the deep renewal needed within the Canadian charitable sector is summarized here. A Canadian review of the charitable landscape can be seen here (https://www.cardus.ca/research/social-cities/reports/). What tools can we use to better understand our planning and faith-based organizational context? How can we anticipate these dynamics changing? A number of tools have been collected, experimented with, and modified within the City Soul experience. The tools have been primarily used in the development of the Context reports, but users may choose to deploy tools as they see fit. City Soul tools will continue to be modified and improved as users creatively engage City Soul in their own city, town or community. The Registered Charity Information Return (the CRA’s T3010 form) provides a wealth of publicly available information on FBOs. All charities are required to complete an annual filing, providing a comprehensive list of charitable activity within a jurisdiction. Furthermore, FBOs are easily identified by faith group or denominational affiliation. Other helpful information is provided, such as charitable purpose and annual revenue, which can serve as a proxy for the size and scope of a FBO. Within the context of the City Soul project, T3010 data can be used with applications such as Google fusion maps to better understand the spaces FBOs occupy. Mapping can illustrate where FBOs are concentrated and where they are underrepresented or absent. The T3010 captures essential information about charities and their operations. Basic information such as location, names of directors, purpose, revenue, expenditures, and liabilities provide an overview of charitable work. There are approximately 85,000 charitable organizations in Canada. The T3010 has evolved over time, and not all questions on the T3010 pertain to every charity. Furthermore, completing the document can be complicated and approximately 38 percent of charities file late (Brouard 2014). Researchers have noted that T3010 forms completed by charitable organizations often contain errors and omissions. Self-reporting can result in recording and calculation errors concerning assets, liabilities, and revenue (Brouard 2014). City Soul users may encounter some challenges specific to the project. For example, T3010 filing provides mailing addresses of charities that can help identify FBOs operating in particular jurisdictions. Some FBOs may list a mailing address such as a home office, but perform their charitable activities in a different neighbourhood. Therefore, the mailing address does not always align with where charitable activities occur. FBOs may remain registered but perform little activity. Examining revenue streams may help to identify registered but otherwise dormant FBOs. Approximately 94 percent of FBOs register as charities. Some do not for various reasons. Small and informal groups or communities may be operating in a neighbourhood without being captured in the T3010 data. The T3010 may also fail to capture FBOs that are social enterprises that don’t register for charitable status. Such groups may have a positive social impact on a neighbourhood but are not captured in the data. The Halo Calculator is an estimating tool that can be used to quantify the economic value of congregations to their neighbourhood. The Halo Calculator estimates “Direct Spending” for every registered charitable congregation or place of worship in a given community by means of data filed by those charities with the Canada Revenue Agency T3010 form. It does not present formal research results. There are variances across community sizes, locations, and charitable entities. Yet for charitable places of worship, their generative nature appears to be significant and it is hoped that the Calculator will spark discussion, exploration, and further research. One way to understand the dynamic between physical and social infrastructure is to use mapping tools. These free, open source software tools allow City Soul users to visualize the physical presence of FBOs in a community. Below are two examples from Cambridge City Soul that utilized T3010 data to illustrate how mapping tools can be used to communicate a landscape survey of FBOs in a community. In this first example, the locations of 84 FBOs were mapped. Their respective sizes, based on reported income on T3010 filings, are noted. In the next example, a “heat map” was created to illustrate the concentration of places of worship across the city. Open source mapping software tools are free and easily accessible. It may take time to learn how to navigate them, but most provide helpful tutorials. Figures 1 and 2 above were created using Google Fusion Tables, a data visualization web application. The app allows user to easily import their data and manipulate data to create helpful visuals. The Geographic Resources Analysis Support System (GRASS) is a user-driven, open source software project that supports geospatial data management and analysis, image processing, graphics and map production, spatial modeling, and 3D visualization. QGIS is an open source geographic information system software. It bills itself as a user-friendly tool for visualizing, managing, editing, analyzing data, and generating printable maps. One of the central aims of City Soul is to facilitate stronger relationships among FBOs. There can be a tendency among FBOs to operate within small silos of limited networks. Expanded networks increase the potential for knowledge-sharing and cooperation. How do I map a network? Below is a guide illustrating how to map a network. Consider mapping formal associations, such as denominational connections, as well as semi-formal networks like ministerial councils. Volunteers or members will have additional connections between groups. However, mapping all the connections could be far more complex than necessary. What can I learn from a network map? Choose a setting (context) to map, such as work, home, conference, email, project, or hobby. Start with yourself. Draw a node in the middle of the paper. Add 5-10 primary people for the context you have in mind. Draw lines between you and the key people you’ve added using the guide below. Add in any other people who you think are well connected to the people you listed. Draw in these lines using the guide below. This is the Core Network. Now think of any other people who are not as well connected to yourself or the Core but who have something to do with the context. Draw in lines using the guide below. This is the Core Network. Finally, think about people who could be involved or who could become part of the context you have in mind. Add them in and draw lines where you think there may exist connections. 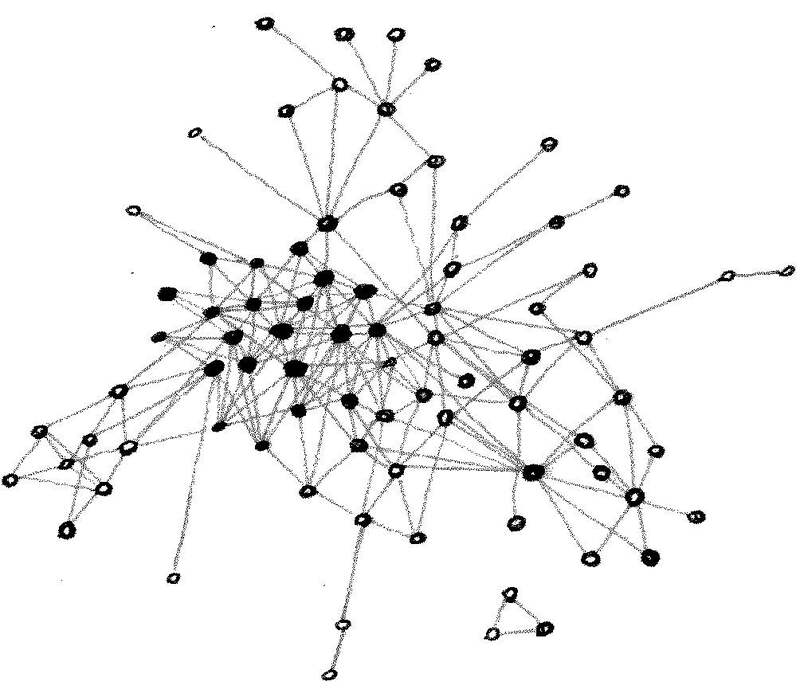 This is a Periphery Network. You can add another feature by putting arrows on the lines between people where you can. This begins to provide dynamics to the topology or structure of your network. This is a Potential Network. Use the network analysis practice sheets on your own network. It can be interesting to swap your network map with someone and take turns analyzing what you see. Team members could each create their own maps of a common project to see how the network structure and dynamics vary by perception. How many hops from one side to the other? What is this a network of? Which are the periphery (or isolated) nodes? What are the strengths of this network? What actions could be taken to build on this? What actions could be taken to make the network more resilient? What nodes, if removed, would increase the number of disconnected groups or nodes? What does network mapping look like in practice? How do we build stronger personal and organizational ties between city planners FBO leaders? How can we foster the exchange of insight and build trust and collaboration? Planning in Good Faith is an event designed to enhance communication, understanding, and collaboration between faith communities and city planning and administration teams. The event is comprised of a presentation by an FBO representative (Faith 101) and a presentation by a city planner (Planning 101). The event includes opportunities for questions and discussion and can include an exploration of planning issues that are of immediate concern in the city. Pre-meetings with a very small, informal group of planning/council members and two or three key faith leaders. This may require one-on-one meetings with each to build up sufficient trust and to explain the direction that collaboration could take. It is generally best if there isn’t a single-issue driver for the meeting, for example, some crisis or demand. The overall intent is to build trust and, in time, organizational capacity so that regular interactions occur rather than “crisis only” communication. If a network of interested parties can be established by both parties (faith leaders and planning professionals), consideration may be given to a more significant meeting, such as a two-hour working lunch that allows various parties to introduce themselves, explain their work, and signal their interest in working together. A public or semi-public event (primarily aimed at faith-based leaders across the spectrum and then a few planning point people and local councillors if possible). The core idea is to have a credible faith-based leader describe the unique challenges and views that faith communities bring to city building, the kinds of organizational and institutional dynamics that characterize their work and context– e.g. heavy reliance on volunteers and voluntary contributions, organizational ties to long-standing religious traditions and practices, capacity challenges with too few people doing too much, etc. Similarly, someone from the planning community would explain their unique challenges, what they can and cannot do, how they are limited, how they are empowered, their role in the city, and their role as citizens and community members. Municipal planners represent the City’s views as expressed in the official plans, zoning regulations, and other directive documents. They provide professional opinions that arise from training and research related to the issues in question. Ideally, their personal views will not interfere with an objective analysis. Urban planning isn’t something faith-based organizations spend much time considering. When planning issues do catch the interest of FBOs, the posture is often reactionary rather than a thoughtful engagement over the vision and purpose of a neighbourhood. The long cycle impact of planning rarely intersects with the agenda of FBOs. This oversight is a loss for communities because the social and cultural intelligence within religious organizations is a profoundly important ingredient in the social ecosystem. FBOs have much to contribute to the physical and social spaces around them. The bricks and mortar of the city are interrelated to the social connectedness and human and social capital within these spaces. For example, social isolation is becoming a prominent concern. One study suggests that the portion of people saying they have no significant confidant has increased threefold within a decade (Holt-Lunstad Smith and Layton 2010). A growing body of evidence points to the significant social and economic costs of isolation. The challenge of creating social and cultural connection could draw both municipal and faith leaders to collaborate more effectively. Faith 101 is a point of engagement between FBOs and planners. The presentation provides an opportunity to explore the places where FBOs see themselves within the community and to communicate essential values that inform their engagement with the community. As FBOs articulate their message, there are three key challenges to consider. First, FBOs must adjust to the pace of change within city planning. Developing plans can take years or even decades to develop, modify, and implement. FBOs will be challenged to think beyond current issues and will need to consider the context of a neighbourhood. Second, faith groups are diverse not only in their core beliefs, but in their approach to public engagement. Some groups fulfill their purpose as an alternative community while others welcome engagement. FBOs have diverse purposes, from providing healthcare to meeting spiritual needs, and vary in size and budget to accomplish these objectives. Third, the complications surrounding the diversity of the FBO sector are compounded by the lack of a singular voice to represent all organizations. The City may wish to engage FBOs, but where no single voice represents all FBOs, outreach and partnership to multiple leaders and organizations can require considerable time and effort. In order to better engage with the municipality, FBOs will need to engage with one another in a coordinated manner. The Planning in Good Faith event provides a catalyst for this kind of engagement. What compels individuals to gather in faith communities? How do faith communities navigate the relationship between the needs of their internal community and their place within the broader community? What unique contributions do faith communities make to the common good? What are the recent partnerships that faith groups have formed within in the community? What do faith communities require to better support the common good in their community? Patterns of human interaction inform the spatial needs of a community. Within the municipal context, social infrastructure can inform the development of better physical infrastructure. Municipalities benefit when paying attention to the social ecology of their communities. Of course, many forces shape how spaces are used, whether economic, environmental or some other catalyst. Consider the iconic examples of Detroit or New Orleans. Where the social fabric of communities begins to thin, short-term and patchwork policy interventions are inadequate. Spatial design requires consideration for how physical and social infrastructure relate. Planning can enhance or weaken the social fabric by marginalizing social institutions and increasing social isolation. Municipalities also face the challenge of adjusting to demographic changes, often not of their making. Quality research can unpack emerging trends and inform possible opportunities for innovation. Planning 101 provides the opportunity to help FBOs understand the forces and processes that contribute to spatial planning. By increasing knowledge among FBOs, it empowers these organizations to consider their role in their communities and neighbourhoods through a more informed perspective. This benefits the municipality, as FBOs can be deep repositories of meaning and culture within neighbourhoods. Usually FBOs have no established connection with the planning process. Planning 101 creates the space for an informed conversation to begin. What ideas and philosophies guide city planning? What influences city planning? For example, how do provincial and federal regulations influence city planning? What issues do planners consider? For example, what influence does the environment or heritage have on city planning? What is the role of citizens and community groups in the planning process? The role of churches (as well as synagogues, mosques, and other sacred spaces) is evolving rapidly as faith leaders adapt to an increasingly diverse urban environment. While some congregations are experiencing decline, some suburban congregations are growing. The traditionally informal contribution of faith institutions to community life has become an essential part of the social safety net provided by municipal authorities. The list of questions is long and challenging. Planning in Good Faith will bring together faith leaders, urban planners, architects, and others with an interest in finding responsible solutions to complex questions. Rev. Eric Jacobsen is senior pastor of First Presbyterian Church (Tacoma, Washington) and a PhD candidate at Fuller Theological Seminary. Eric Jacobsen previously served as the Associate Pastor of First Presbyterian Church in Missoula, MT from 1995-2004 and has taught as an Adjunct Professor at both Regent College in British Columbia and Fuller Theological Seminary. Eric is author of the nationally recognized book Sidewalks in the Kingdom: New Urbanism and the Christian Faith (Brazos 2003), which explores how Christians can have a positive impact in America’s cities. He is also the co-editor of Traditions in Leadership: How Faith Traditions Shape the Way We Lead (DePree 2006), who has authored numerous articles exploring connections between the Christian community, the church, and traditional neighbourhoods. He has been interviewed by the Washington Post, the Los Angeles Times, and other national media, and he has presented lectures for various secular and religious institutions including Calvin College, the University of Virginia, the Christian Community Development Association, the American Planning Institute, the American Academy of Architects, and the Congress for the New Urbanism. He has past involvement in Young Life. Eric received his MDiv from Princeton Theological Seminary, his BA from the University of California at Berkeley, and additional training from the Billy Graham School of Evangelism. While at Princeton, he was awarded a Samuel Robinson Prize for mastery of the Westminster Catechism, and the E. L. Wailes Memorial Prize in New Testament for his analysis of 1 Corinthians 12:1-3. As the Senior Partner of with BKDI Architects, Peter Burgener carries broad responsibilities in the ongoing practice of the firm, since he established it in 1978. With a full time staff of over 65 architects, interior designers, landscape architects, technologists, and contract administration personnel, BKDI is one of the largest architectural and design firms in Western Canada. Peter is extensively involved in project development and has been responsible for a wide range of projects, including master planning, office buildings, shopping centres, hotels, multi-family residential, hospitals, and corporate interiors. Peter has served as a Member of the Calgary Planning Commission as well as the Development Appeal Board. He is also the recipient of both regional and national awards in planning and design, has served as the President of the Alberta Association of Architects, and is a Fellow of the Royal Architectural Institute of Canada. Since 1999, Peter has continued to write a regular column for the Calgary Herald newspaper, entitled “Urban Thinking.” Peter focuses on urban design, planning, and architecture. In addition to his professional career, he has also been actively involved in a broad range of community activities. David Down earned a BA from the University of Victoria and an MEDes (Architecture) from the Faculty of Environmental Design (EVDS) at The University of Calgary in 1988, receiving the Royal Architectural Institute of Canada and Environmental Design Gold Medals. After working for Jenkins and Sturgess Architects, he formed in 1995 the partnership of Down & Livesey Architects with Graham Livesey, and together they developed a varied and award winning practice. In 2005 David joined the City of Calgary as Senior Architect/Urban Designer, where he has worked with the Centre City Team to advocate for the importance of great architecture, urban design, and sustainable design in city building. He is a registered member (and past president) of the Alberta Association of Architects and a fellow of the Royal Architectural Institute of Canada. He is the chairman of the Calgary Architectural and Urban Studies Alliance, regional correspondent for Canadian Architect magazine, and a contributor to various design journals. He is also an adjunct professor in EVDS, where he participates in Architecture and Urban Design studios and periodically lectures on Asian architecture. There are significant cultural, faith, identity, and worldview dynamics at work in faith communities. They are not just another kind of business, education institution, charity, or not-for-profit. Faith communities provide the context for powerful life moments for many people. They provide significant moments and places for equality. They provide a means by which people help others —giving money and time. They teach and emphasize that our own well-being is not the most important consideration. This happens through all life phases in different ways. Faith communities have specific visions for how to approach caring for others. There are tangible ways that self-sacrifice is organized, administered, and sustained. A common gathering place to practice their respective faiths is critical and historically rooted. Sacred places and spaces are vital even to those who do not practice a particular faith. These places bind, shape, and give life and new possibilities for people. Faith communities provide generational continuity. They help individuals and groups remember and keep alive important points of reference. They foster deep development of culture and exchange of ideas. Faith communities have often helped us remember important moments—individual and collective—over time. Many places of worship provide a wide range of services and supports to communities. We are often unaware of how extensive and important this is until it is gone. Administering, organizing, and leading all happen out of places of worship. Many people find in faith communities a common sense of belonging, belief, and practice. Solitary individuals don’t do well over the long term. Faith communities are vital places of belonging. I am writing to invite your participation in a project called __________ City Soul. The project’s goal is to improve communication and collaboration between the City of [ ]’s planning initiatives and faith-based communities that are vital to community well-being. Toward that end, we are planning an evening meeting on [Date] 7:00-9:00 p.m. called Planning in Good Faith. We will meet at the [location] and the evening will include brief presentations on “Planning 101” from the City of [ ] and “Faith 101” from two faith community leaders. Ample opportunities for questions regarding current issues and interests will be built into the evening. Explore the level of interest in developing more effective collaboration. [If needed] [Cardus is a public policy think tank based in Hamilton, Ontario that has received funding to explore and develop this intersection of faith communities and city planning.] We have been meeting with a working group comprised of a variety of faith leaders, community leaders, and planning team members in preparation for wider participation. Another letter of invitation with the particulars of the [previous if needed] meeting will be sent out on [date]. It would be helpful to hear from you or others in your faith community directly regarding your level of interest in being involved in this process and future meetings. Primary function is to provide input on fair use of land according to laws, uses, and context. There are always multiple competing interests. There are key documents that planning must work through. Although they vary from place to place in the particulars, there are common documents that provide legal and process rules. Planning needs to, and is formally obligated to, consider the public interest. The public interest or common good is far from simple. Planning is required to consider the good of the whole community, not just a few. How do the resources of the community get allocated to benefit everyone? How can interests be balanced to benefit the community? Nothing stays the same. As a constantly negotiated process, the dynamics of exchange at all levels are continuous. Sometimes there is a need to preserve what we have. Sometimes what we have impairs what we need today or might need in the future. Planning must be a just and fair process, concerned with transparency, equality, and the balance of needs and demands. Planners must be aware of how inequality can get imbedded in processes if we aren’t paying attention. Planners need to involve and engage the whole spectrum of the community. How are we advancing the understanding of the socio-cultural good of religion in the city? How does religion contribute to well-being in cities? What form do these religious public goods take? What are their shortcomings that would be valuable to address? How have City Soul strategies been applied in other communities or cities? What worked? What didn’t? What can we learn from other projects? The City of Edmonton is a dynamic and vibrant place of growth and investment. When Cardus first explored the City Soul initiative in Edmonton, the city was projecting a 50 percent increase in population growth by 2040. The growing city initiated a development plan called “The Way Ahead” to manage continued growth and to lay the foundation for policy directives and government initiatives. The Way Ahead covered “strategic directions for the preservation of critical resources and environments, the transformation of urban form, the liveability of the city, the shift in transportation targets, the sustainability of municipal finance, and the diversification of the local economy” [Edmonton City Soul – Research Report, 2]. What was missing? Absent from the Way Forward were faith communities and their role within the municipal fabric. The Edmonton City Soul project examined three aspects. First it reviewed City planning documents to determine the planning aims and priorities and to seek soft edges where FBOs could engage with the planning process. Second, the project conducted a landscape analysis of FBOs using government data and other search engines. Third, the project identified opportunities for engagement between FBOs and City planning. A number of opportunities were identified. As the City Soul project noted, new plans for Edmonton did not account for institutional space. FBOs are uniquely placed to understand the quality of life in the surrounding neighbourhoods, so these organizations in Edmonton were encouraged to be a voice for their communities. The City Soul project encouraged faith-based organizations to develop relationships with planning departments and representatives through public information campaigns or through project-specific partnerships like neighbourhood revitalization projects. FBOs were encouraged to make connections with the University of Alberta, which was developing a planning school. Charitable organizations were encouraged to look for professional development opportunities through the school. The development of the school presented opportunities to facilitate and support interaction between planners and the charitable sector. Finally, FBOs were encouraged to engage and collaborate with one another to discover where partnerships exist and where new cooperation could be fostered. In 2009, Cardus happened across the downtown plan for the City of Calgary. The objective was to have a full service downtown where residents could live, work, play, raise a family, or myriad other things that individuals and groups might want to pursue. The complication was that in the plan, no provision was made for the religious practices of the prospective new inhabitants, particularly if their practices included a need for sacred or social service delivery space. When Cardus engaged with the City of Calgary, the City was, to their credit, open to the possibility that there could be another dimension that could enrich their already well-developed plan. An audit of downtown institutional capacity was commissioned and one outcome was an eventual change to the Centre City Plan in Calgary that included formal room for faith-based organizational engagement in developing the plan. This development led to an opportunity to further explore how FBOs were represented in the city-wide planning policies. Three roundtable sessions were held that “addressed practical planning issues such as parking and zoning, developing and retrofitting suburbia, social service and volunteerism, art, heritage and architecture, health, community safety and emergency planning” [Calgary City Soul, 3]. The roundtable sessions revealed a lack of knowledge from both FBOs and City planning. Bridging the two groups was identified as a key objective of City Soul. Additionally, it was noted that many contributions made by FBOs in the city were undocumented. The work of City Soul revealed that FBOs have a strong physical and social presence in Calgary and are a significant repository of social capital. The project proposed a three-pronged approach to improving FBOs relationship with City planning. First, educational opportunities need to be cultivated to facilitate a knowledge exchange. Second, FBOs need to increase their leadership capacity to better engage the city. Finally, FBOs were encouraged to consider how to engage City by developing a community engagement approach. The experience in Calgary provided lessons for both the city and faith communities. The City Soul report recommended that City planners and administrators would benefit from considering FBOs as more than merely service delivery organizations. FBOs have a full range of resources that the City could benefit from. FBOs need better integrate these organizations into their deliberations. FBOs are a significant repository of social capital including volunteering, neighbourhood support, and donating, as well as other forms of civic engagement. Yet these groups have no collective vehicle through which to communicate to the City. FBOs are largely unaware of City planning roles, functions, timelines and processes. FBOs need to be intentional about connecting with City planning. Calgary City Soul points to the potential benefits for the community when FBOs and City planning cultivate knowledge exchange. The City of Cambridge is located in the heart of southwestern Ontario, and completes the Tri-city area with Waterloo and Kitchener. Although Cambridge is the smallest of the three cities with a population of approximately 126,750, it is forecasted to grow 36 percent by 2029. Planning for this growth was a significant concern when elements of Cambridge City Soul were released in 2016. One of the central aims of City Soul is to develop connections among FBOs and to initiate a conversation between FBOs and city planners. Nearly 50 FBOs and community leaders gathered in early March 2016 for a Planning in Good Faith event, the result of the significant cultivation of within the city. Participants heard from faith leaders about the needs and contributions of FBOs in the community through a Faith 101 presentation. The presenters explained what compels adherents to gather in faith communities, the values that motivate their participation within the wider community, and how places of worship facilitate purpose, meaning and belonging. The evening also featured a Planning 101 presentation that illuminated the process the City of Cambridge navigates to develop and deliver good planning. Participants learned about the principles and regulatory influences that guide planning and how planning contributes to the common good. The Planning in Good Faith event was designed to encourage further dialogue. The Cambridge City Soul Context report was released nearly two months later, and explored the potential to increase social infrastructure through the nurturing of relationships between FBOs and the City. The report engaged with the City’s key planning priorities, identifying a current optimal window for engagement with the City. After reviewing planning documents, the report identified several core planning priorities, noting the absence of references to faith and religious institutions. The report surveyed the FBO landscape utilizing CRA charity filings (T3010) data. Using mapping tools, the data provided greater insight into where FBOs were operating, marking the areas of concentration and the spaces were FBOs were least present. The report identified points of intersection where the FBOs and City can further engage with each other. The report concluded with four recommendations. First, a need for further education was identified. FBO leaders and city planners would benefit from continued learning from each other. Second, the Cambridge Context report recommended that FBOs select a liaison to interact with the City. A single, dedicated point of contact would be efficient and effective. Third, the report encouraged greater relationship building among individual faith leaders and the city planners. These relationships develop trust necessary for further cooperation. Finally, FBOs were encouraged to be selective in their engagement with the City. A large, coordinated engagement with a few planning issues would be manageable and effective. The relational capital developed in preparation for a Planning in Good Faith event and the knowledge acquired through the Context report has created a tremendous opportunity for greater collaboration between FBOs and the City. 1) Sources: Brouard, François. 2014. “T3010 Challenges for research.” Discussion paper. Ottawa: Sprott Centre for Social Enterprises. 6) [Cambridge Faith 101 session notes Appendix 2]. 7) [Cambridge Planning 101 session notes appendix 4].